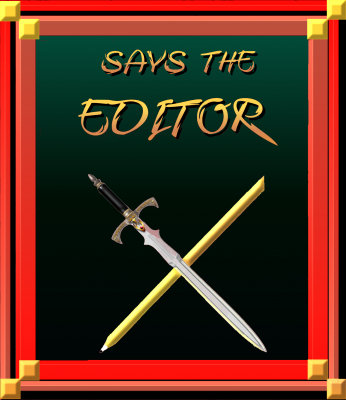 Says the Editor: Righty or Lefty? Are you a righty or a lefty? And why does it matter when you write fiction? Now, yeah, it’d help if we knew which side things came from. Maybe this isn’t an issue of righty or lefty in terms of which is your dominant hand, but maybe it’s an issue of righty or lefty in terms of which side you skew toward. Maybe handedness and eye dominance plays a role. I’m not sure! So. On the page, I’m envisioning that the blast comes at the character from the left, and s/he falls to the right. I’m also envisioning that the character is right handed. 1. Do you envision it the same way I do? 2. Are you a righty or lefty — both handedness and eye dominance? Let’s see how this shapes up. In the meantime, when you’re writing action scenes and things are coming at the characters from the sides, maybe throwing in a left or a right every now and then isn’t a bad idea. Make note of the every now and then in the above sentence. That’s important, because if you overdo it, you wind up in the realm of information that’s important for you as the author but not so important for us as the reader. Getting back to Steve, my client whose character got hit from one side, I suggested he change it up to let us know which way the character falls. Thinking more about it, I’d like to know how that fall affects her, too. If she falls toward one side or the other, does it change her reaction, both physical and mental? Does it change the flow of the action scene? The outcome? Would it be different if she were a righty or lefty? And most importantly, how does knowing these few simple details — which is her dominant hand, and which way did she fall — affect how the reader interacts and absorbs what’s happening here? Does it recast their mental picture of the scene? Or does it shore up what they’d envisioned up until they got to that word? Lots to mine in here, huh? That’s what you guys pay me the big bucks for. To sit and think these things through, so I can help you enrich your fiction and help paint those mental pictures that readers need. As always, I’m here when you need me, so never be afraid to speak up.